"Someone" has a lot on his plate. "Someone should do something!" we cry at the TV, helpless in the face of a crisis. "Well, someone is responsible", we say with crossed arms to talking heads on the radio. Wandering the streets, we bleat plaintively, "Someone should open a cafe". Well, someone finally did, and it's a good 'un. 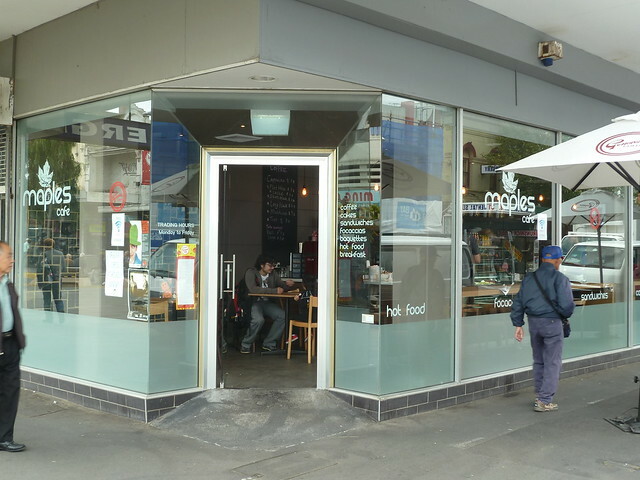 Maples Cafe is right in the middle of Footscray's CBD where a tired shoe shop used to be. 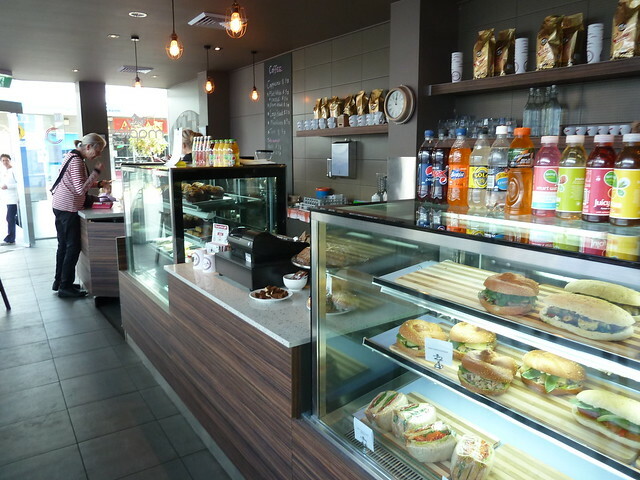 It's neat as a pin inside and serves Genovese coffee and a small but super fresh range of sandwiches and focaccias. 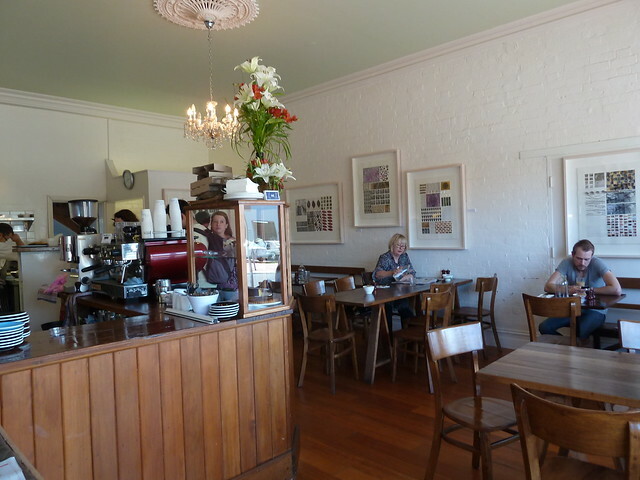 Smooth, dark roast, well-made Genovese coffee, $3.30 for a latte. The original resident of this building was the Maples furniture store. I started explaining this to my mother who sighed good-naturedly, "Oh, I know Maples! They were everywhere! If you needed a table, you went to your local furniture shop down the road, and then someone would deliver it. No Ikea in those days". Ah, the sandwich fashions of Melbourne. I can remember as far back as Schwob's bread, then foccacias were all the rage. 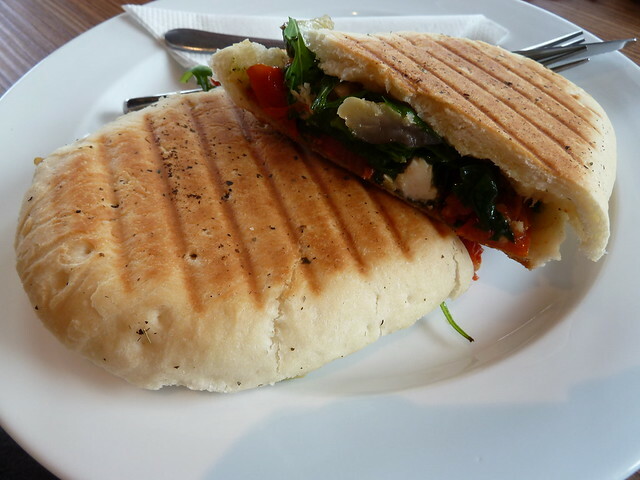 Now it's all panini and piadini. This was retroliciously good. Juicy grilled zucchini chunks, tender vinegary capsicum, mild pesto and the toasted bread just perfectly licked with oil to give crackly edges. Across the road we spotted these letters which originally read EDMENTS. "Edments jewellers," said Mum wistfully. "There was one in every suburb." Footscray's changed a lot and it keeps changing, a process which I find exciting. 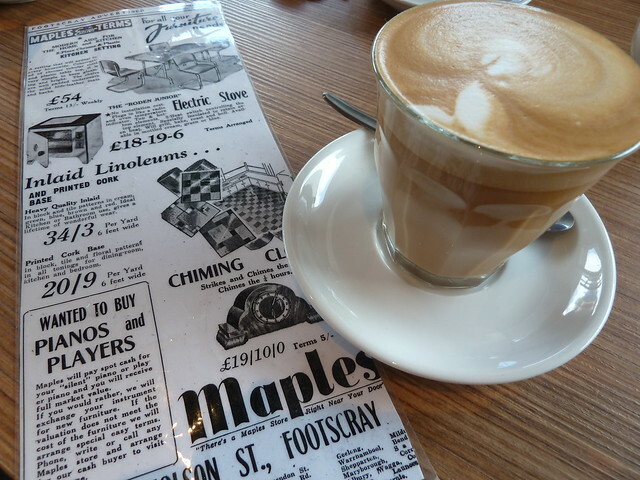 I'm really delighted Maples is here, bringing a fresh presence to Nicholson Street Mall. 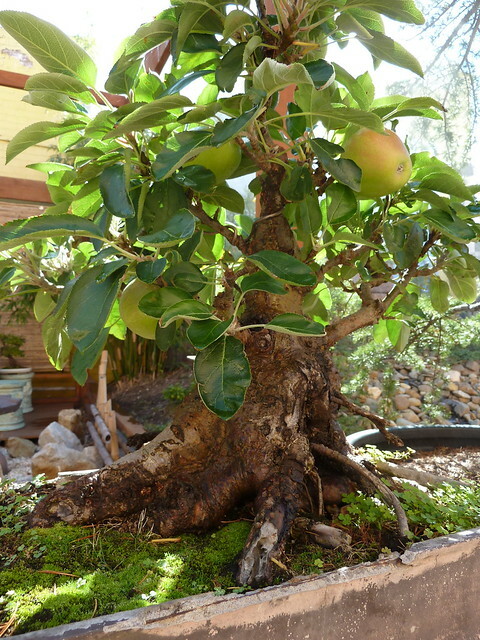 You can read more about Maples in Footscray Life magazine, as well as lots of other great news and interviews. Check out Maribyrnong Council's Footscray heritage trail brochure here. 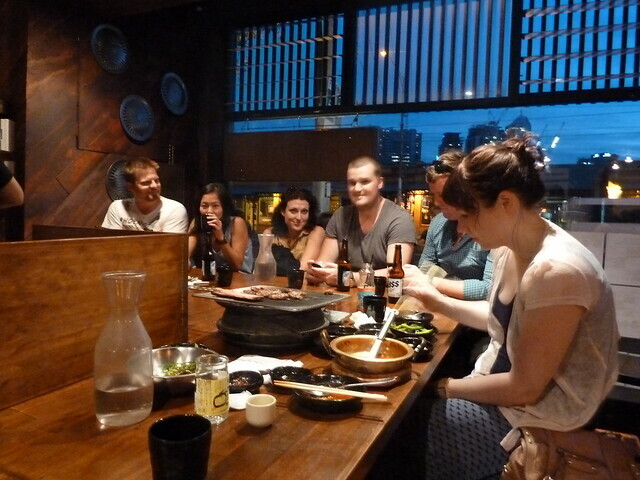 Korean BBQ is heaps of fun. If you are one half of a couple where you regularly lament "but my partner eats nothing but meat and bread", I promise you that Korean BBQ is the way to break that cycle. Who can resist all that smoky, Maillard-reaction deliciousness occurring before your very eyes and most importantly, nostrils? And so it's rice, not bread. Meh, who cares!! Donwoori is the newest in the string of Korean BBQ joints in West Melbourne, although when I say newest, it's been there for about four or five years. It's quite tiny inside, with handsome young men doing a delicate dance with enormous pots of white-hot charcoal. 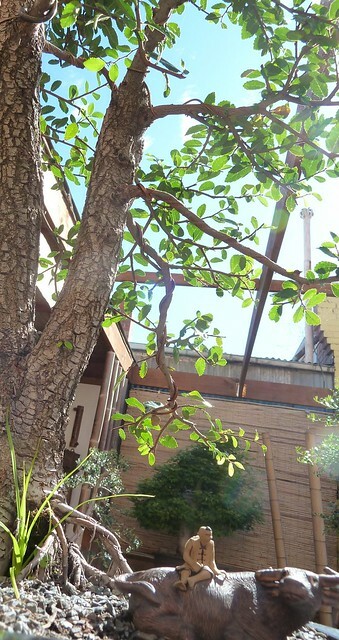 I love all the wood here, like at Wooga right nearby - it gives it such a cosy feeling. 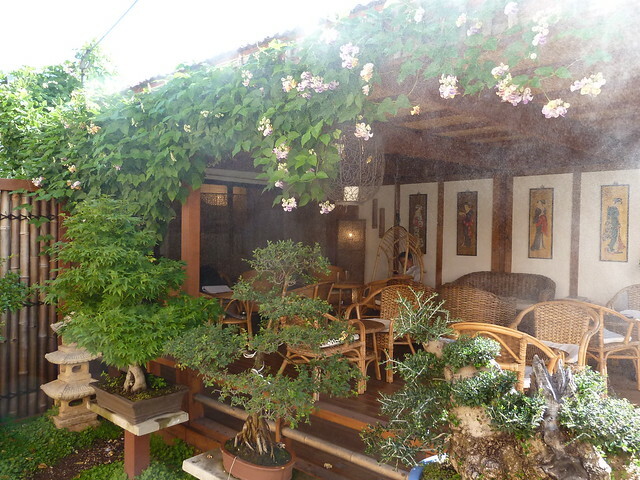 The cosiness gives a convivial atmosphere, helped by the delightful young Korean waiters. 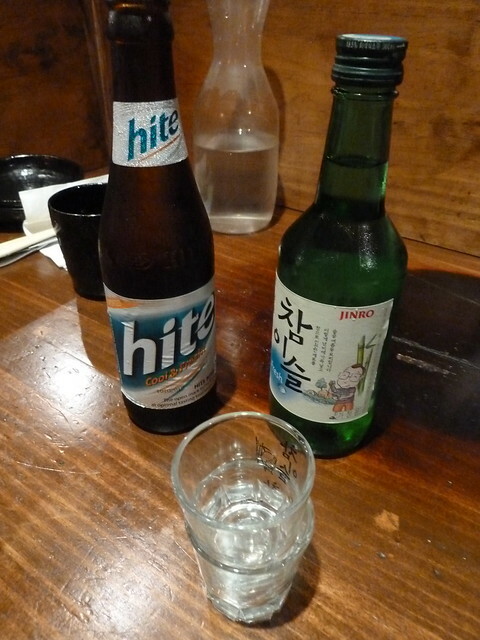 Grab a Hite Korean beer and maybe some soju, sake-like Korean rice wine. I think it tastes like metho but Mr Baklover loves it! 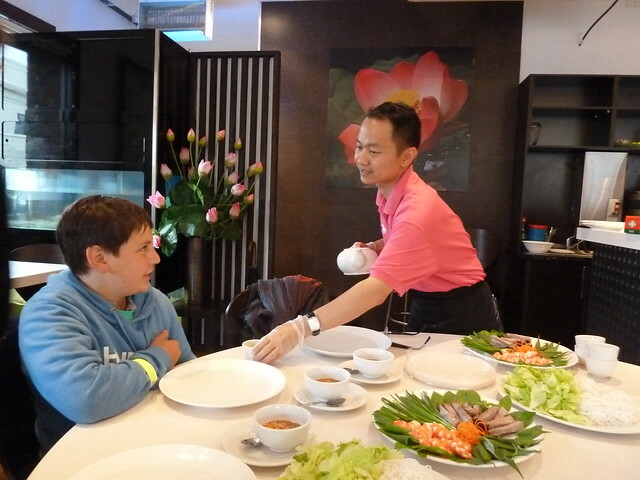 Traditionally in Korea it is rude to pour your own drink, so your dining partner should pour yours, making sure they place their alternate hand on the forearm of the pouring arm. The closer to the elbow you place this hand, the greater the status of the person you are pouring for. There are a whole lot of other customs about who drinks first, who lights whose cigarette and so on. You can pick and choose your meats but the banquet sets are easiest. Little bowls of kim chi and other pickled side dishes arrive first for beery nibbling. Often you will get lettuce to wrap your grilled meat in, but here we got an emerald bowl of shredded spring onion with sweet bean sauce. 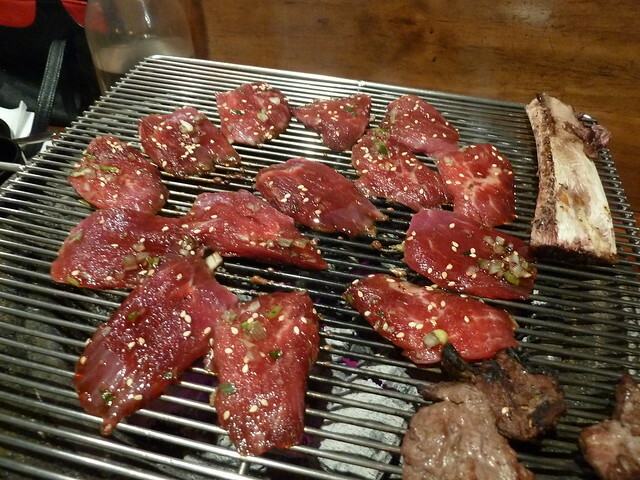 I think it was for eating with the meat but we ate most of it beforehand, it was so yummy! ...marinated flank steak. The meat sizzles away merrily over the hot charcoal and depending on the establishment, will be turned and taken off for you. I find it hard to wait though! 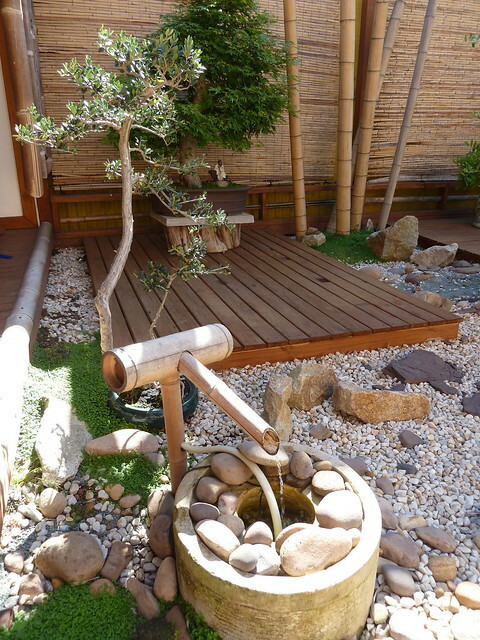 There are sauces for dipping, a sweetened bean sauce and sesame oil with garlic, and tender short grain rice. 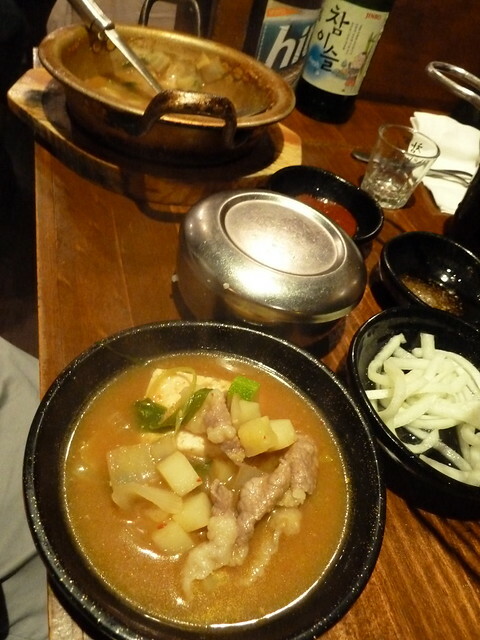 Also part of our set was this soybean paste stew, which was gorgeous, like a warm hug from the inside. It had juicy tofu and seductively soft cubes of potato and zucchini as well as petals of cooked beef, all in a smooth soybean broth. Looooved this Korean pancake. 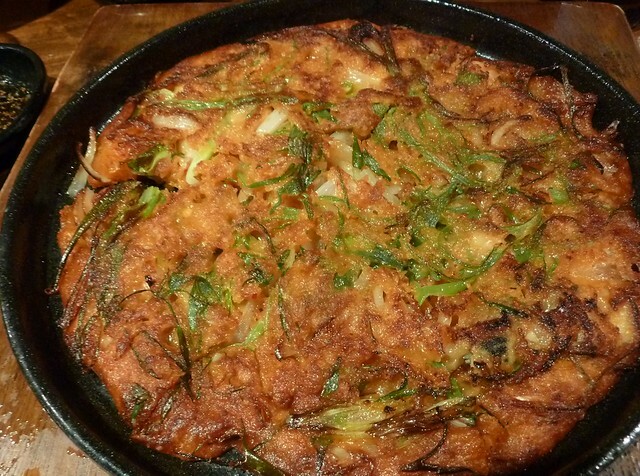 Sometimes called Korean pizza, they are crispy, usually thin pancakes filled with all manner of tender seafood and just-cooked veg. 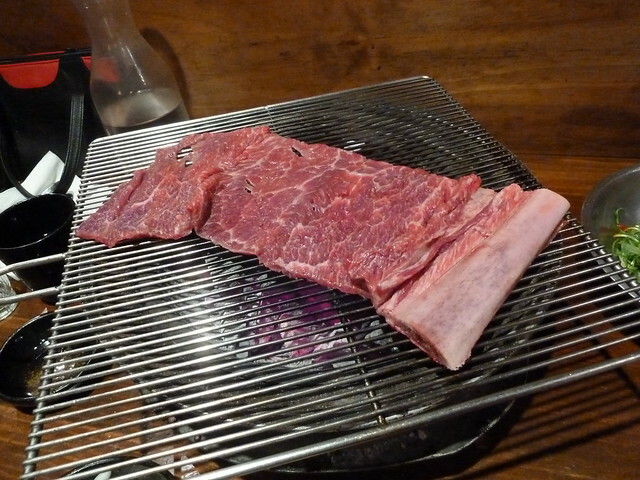 I really enjoyed Donwoori, although IIRC I think the meat was a little tastier at Wooga next door. 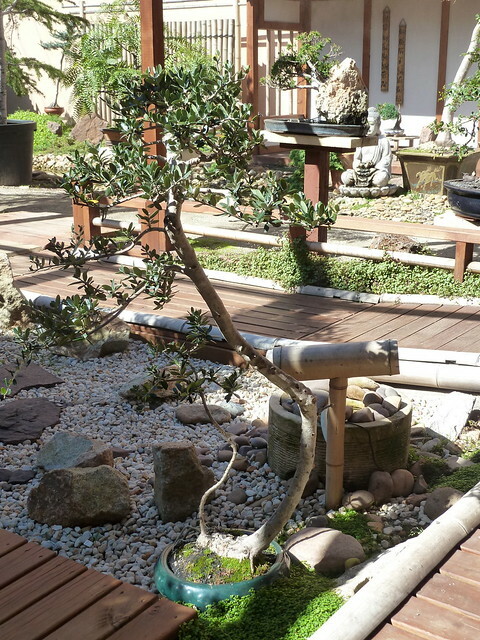 (Also much love for Hwaro in the city which I will write about one day.) 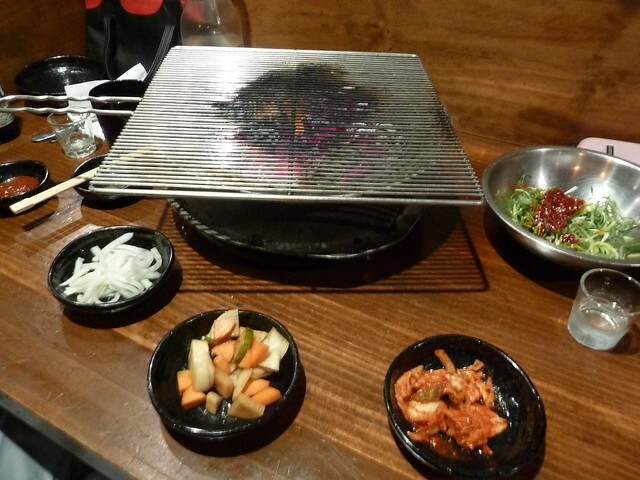 Donwoori is a firm favourite of Melbourne bloggers Agnes and Thanh. Get that stick-in-the-mud partner down there and get stuck in. Oh, Footscray... You never fail to surprise and delight. 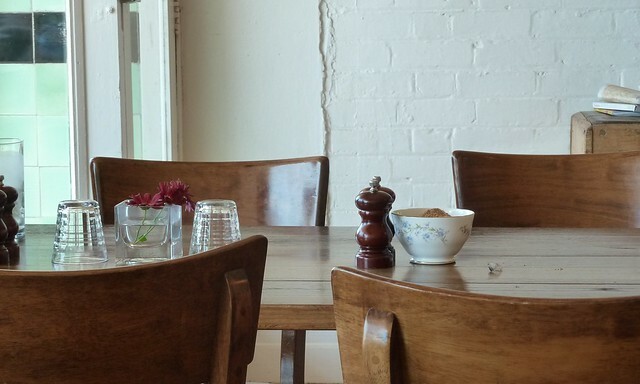 Sweet Grass is a true urban oasis, hidden in plain sight on Barkly Street. 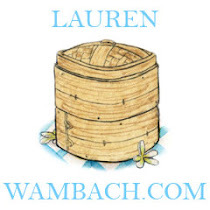 Inside, lean back in a wicker chair and let the ambient music wash over you. 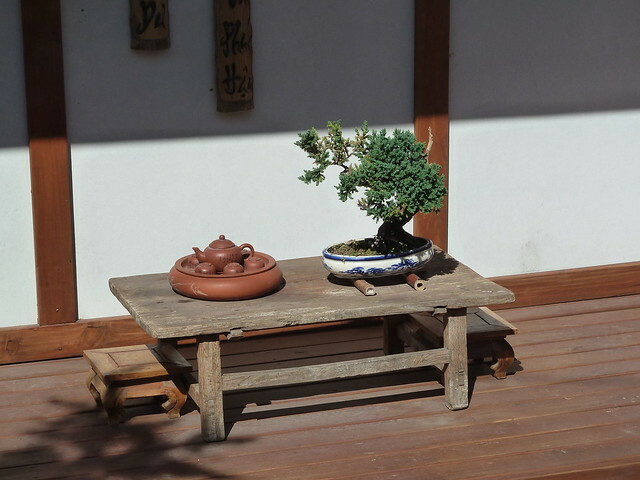 Once you've stopped shaking your head in disbelief, you can order a mocktail, espresso or Vietnamese coffee or one of the interesting teas on offer, like green tea with roasted rice. ...even if that means doing nothing for half an hour, except breathing. that can set us free". With true aristocratic bearing, the Duchess of Spotswood rises above Melbourne geographical rivalry to provide an elegant yet unique experience worthy of anywhere in town. 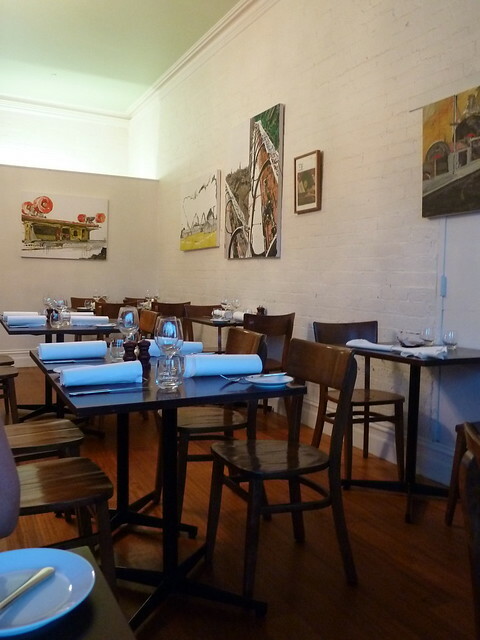 Deciding to take up digs sleepy Spotswood took some gumption, but it's paid off. This light-filled cafe is best known for its sublime British-inspired breakfasts and brunches with chortle-worthy names, like "Poetry (In Motion)" for warm prunes and homemade oat biscuit. They now step it up a notch by opening for dinner. It's a prix fixe menu with three courses for $55. This could be a little surprising if you were just after a bite and a glass of wine, but there's a certain intimacy about a small fixed menu that changes daily. I remember working in hospitality at places with larger menus and inwardly grimacing when someone ordered something I knew wasn't the menu's best. A small, seasonal, set menu means there's little chance of a dud order. 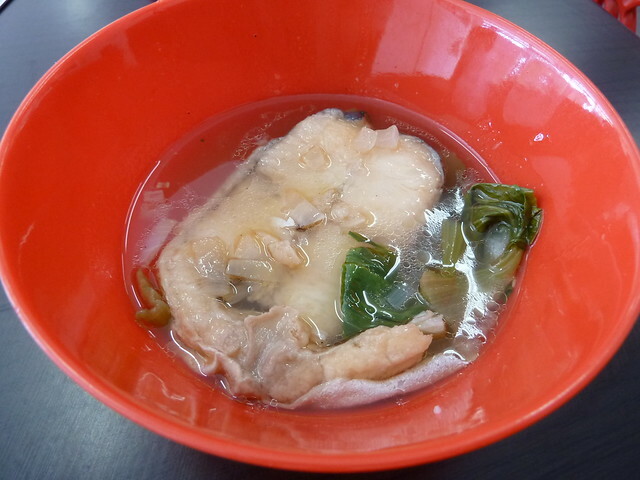 Bonito is a fish similar to tuna, most commonly seen dried and used in Japanese cooking (eg, the flakes on top of agedashi tofu). 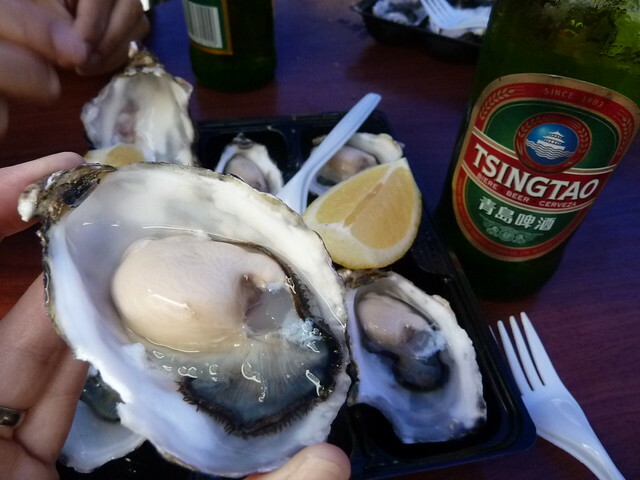 It is occasionally for sale fresh at Footscray market. This silky-skinned specimen was towards the richer end of the fish spectrum, like tuna or mackeral, but still delicately flavoured. The darker flesh married well with the crunch of lightly pickled vegetables. Here, many elements of non-meat-based umami came together to create a most harmonious symphony of flavours and textures. If I were to carry on the Duchess' punny naming traditions, I could have called this one "Nuts, I missed out". The bite I scored was delicate yet oh so satisfying. Jerusalem artichokes, incidentally, are neither artichoke nor from Jerusalem - they're a potato-like tuber native to North America. Each element of this plate was quite exquisitely formed. 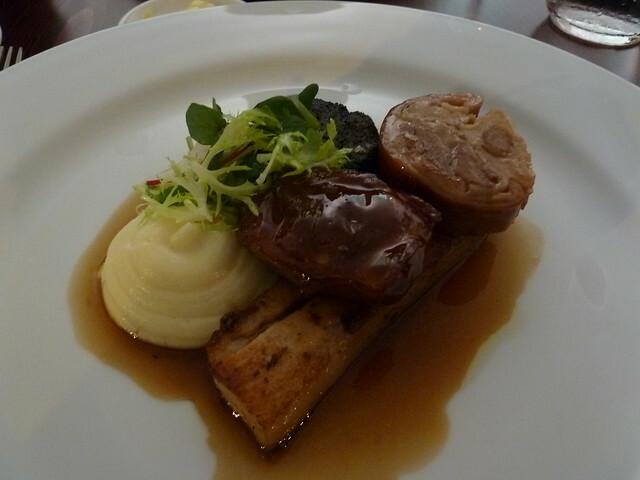 The meat and skin of the round trotter was luxuriantly jelly-like, while the cheek was dark, dense and rich in a syrupy glaze. The sweet black pudding crumbled effortlessly. 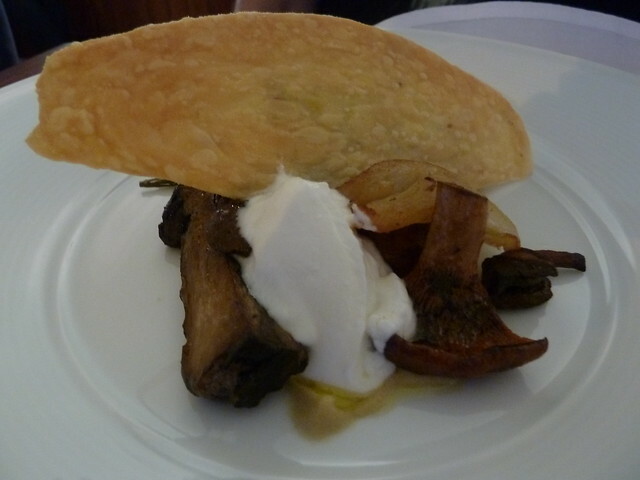 I loved the soft semolina - like superfine mashed potatoes. In an inversion of expectations, where pork belly is normally considered rich, here the pale, delicate strip of belly meat was a lighter foil to the richer secondary cuts. 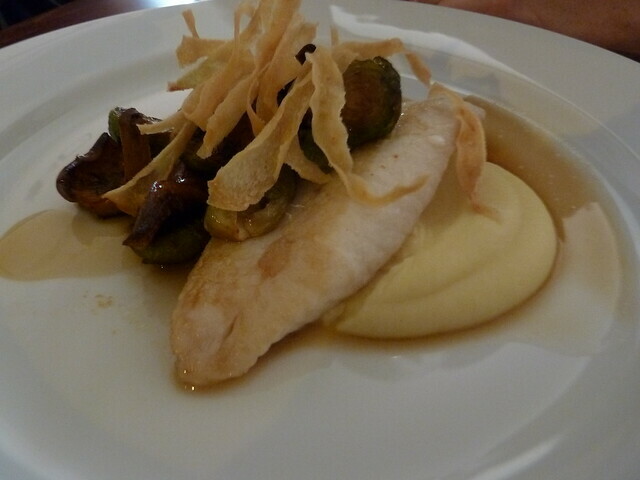 A gentle dish of light, tender fish with cloud-like, satiny parsnip puree. This was gorgeous, well balanced against the deeply-flavoured mushrooms and baby brussels sprouts. S and I had gone all good girl/bad girl up til now - she with earthy yet lighter flavours of chestnuts, mushroom and Dory, while I had swooned into dark, rich fish and lip-smacking pork. 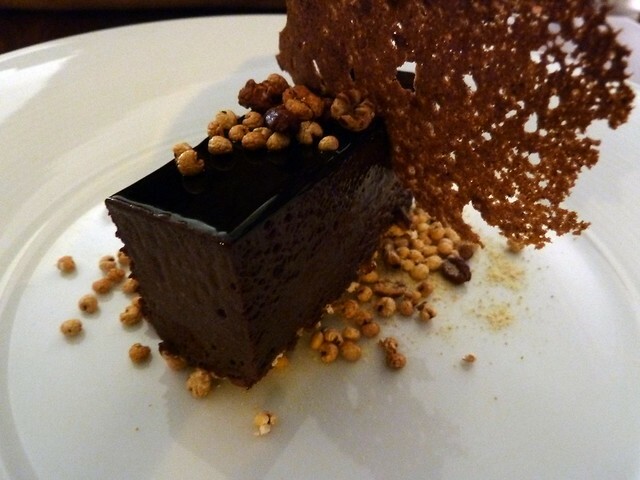 We tipped the scales back with dessert, she going for this intense, mousse-like chocolate cake with a hint of ginger. 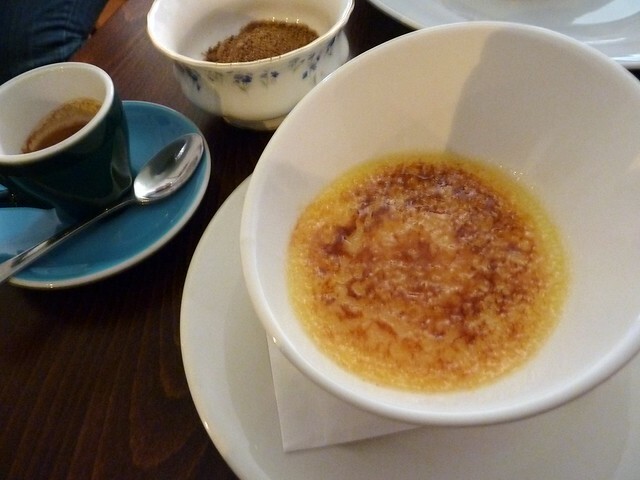 I tested British/French rivalry with this "Cambridge burnt pudding" (ie, creme brulee) infused with bay leaves. It was quite luscious, almost yoghurt-like in texture, with buttery undertones. Duchess has fabulous coffee (Small Batch, plus rotating guest blends). If dinner was a gentle sonnet, a tart-sweet short black was, for the last line, a satisfying full stop. 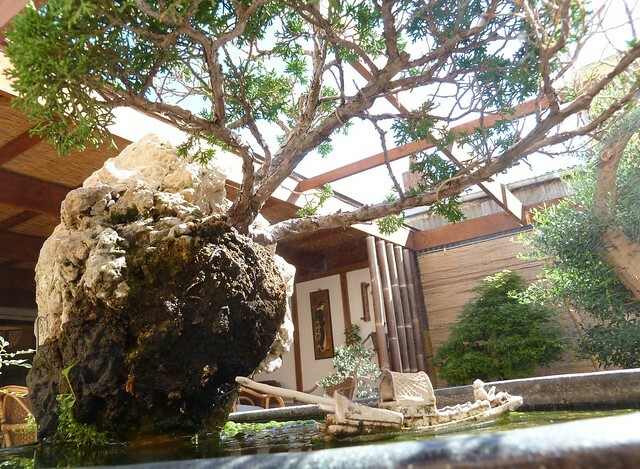 This was an indulgent, exquisitely-crafted meal in an elegant yet still neighbourly setting. The portions are well considered as the fare is rich, although we would have loved the choice to add a bowl of lemony green leaves as an extra. I don't think a whole menu of sides is necessary, but a little palate-cleansing salad would be a welcome option. If you haven't visited the Duchess for breakfast, you really should. 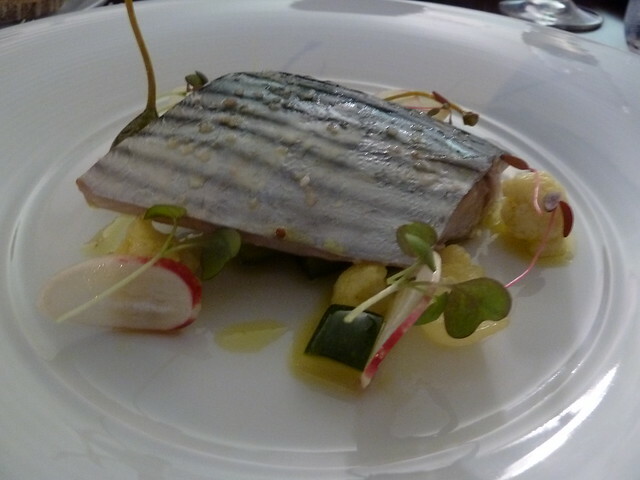 It's quite divine, gently pushing the boundaries with smoked eel (above - not on the menu at the moment, sadly!) or pork jowl, as well as sandwiches like a lovely dry-aged steak number that I would very much like to make the acquaintance of. 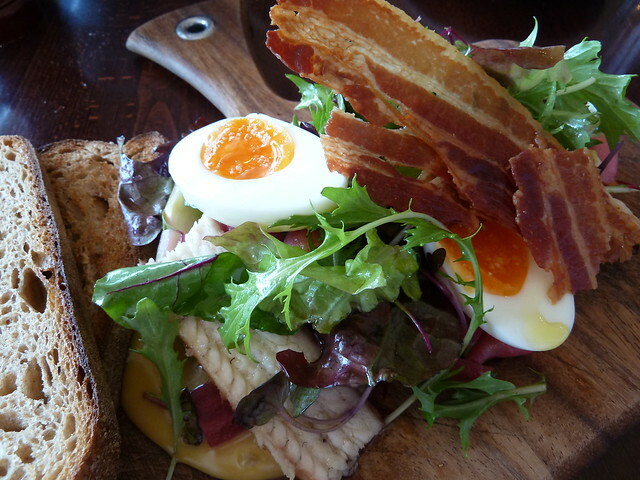 For the calibre of the food, the breakfasts and lunches represent extremely good value. Afterwards, a dainty stroll around Spotty is quite nice, and did I mention parking is a breeze? It doesn't really get much better than this. The Philippines are a truly unique part of Asia. Colonised by the Spanish for over 400 years, Iberian culture has been indelibly infused onto a template already influenced by Chinese, Indonesian and Malay traders. Many Filipinos have very Spanish-sounding names and Christianity is an integral part of the culture. The cuisine comprises empanadas, vinegary adobo braises and European-style breads - yet pancit (fried noodles) are popular as well as lumpia, like spring rolls. There's a huge Filipino presence in the western suburbs. 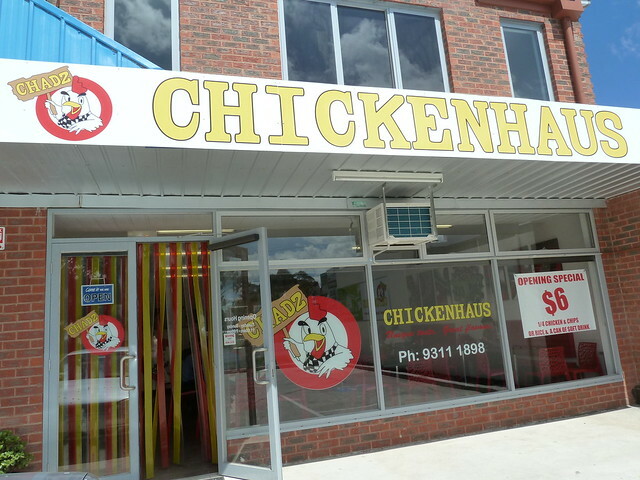 In Sunshine, Chadz Chickenhaus (which sounds like a German restaurant run by an American frat boy) is actually the second branch of a Spanish-style chicken shop that also offers a range of traditional Filipino dishes (the original is in Werribee). 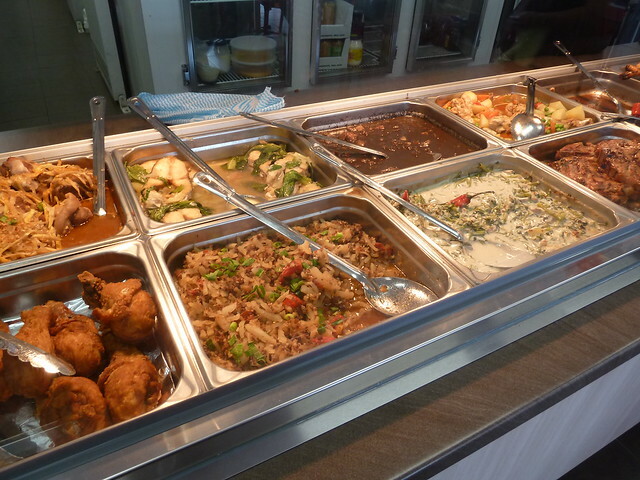 If you don't know what you're looking for, Filipino food can sometimes be a little forbidding - lots of dark, mysterious braises in a bain marie. At Chadz there are lots of lighter options and they are happy to explain everything to you. From top left, we have pork hock, fish in a clear soup, pork blood stew, braised chicken and vegetables and braised beef. From the bottom left, lovely-looking fried chicken drumsticks, white radish with minced beef, water spinach in a creamy sauce and pork chop. There's also great-looking butterflied chicken, a la Nando's, with chips if you like. $10 will get you two choices with rice and your choice of drink. Halved eggplant with beef mince and egg, cooked to silkiness. 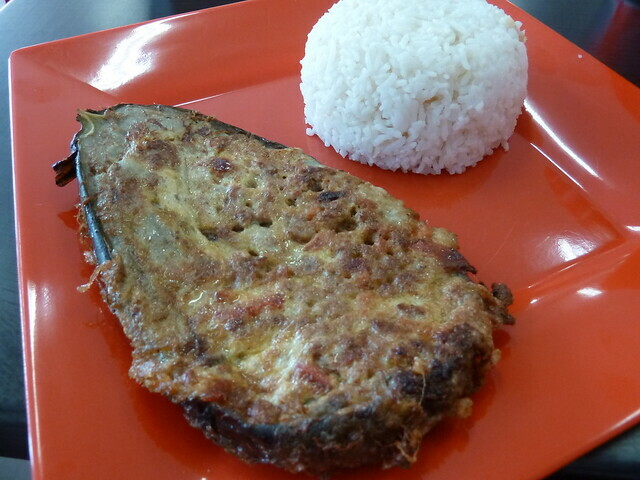 I think this is called rellenong talong. It was quite mild in flavour but tasty, even better doused in lots of spicy vinegar available at the counter. This was a yummy fish cutlet, very fresh and quite firm, somewhat like mackeral. I think it had been lightly fried before being served in delicious, lip-smacking stock. The green veg were really good too. It had bones and I was feeling wussy, so I mainly ate the stock and vegies. 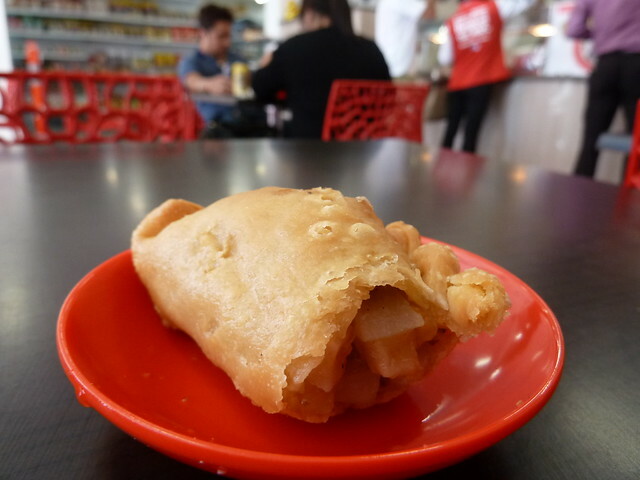 Flaky, super-short pasty filled with potato cubes, a little minced meat and other goodies like sultanas. Chadz is connected to the Filipino grocery next door where, among other things, you can buy balut (instructions: "boil for 30 minutes") which are fertilised chicken eggs with a chicken embryo inside. If Filipino food is new to you as it is to me, I think Chadz is a great place to start. 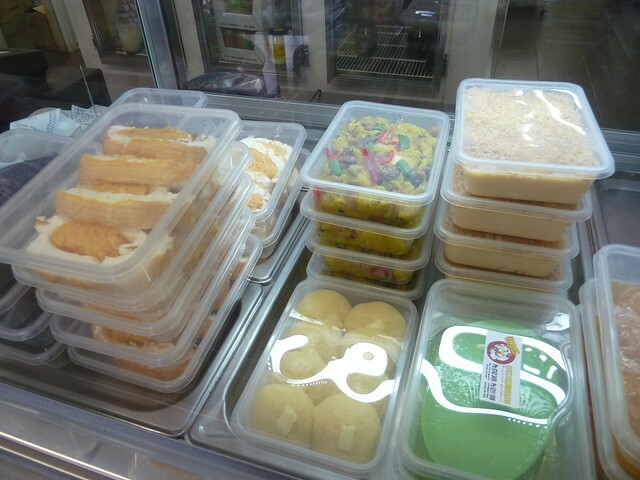 It's sparklingly clean, the food is very fresh and it's made with evident care. They have batchoy, a clear soup with pork offal, noodles and crushed pork crackling from Thursday to Sunday. Looking forward to heading there for the next lazy chicken and chip night, gravy or no gravy. Thank you Clint via Facebook for the tip! 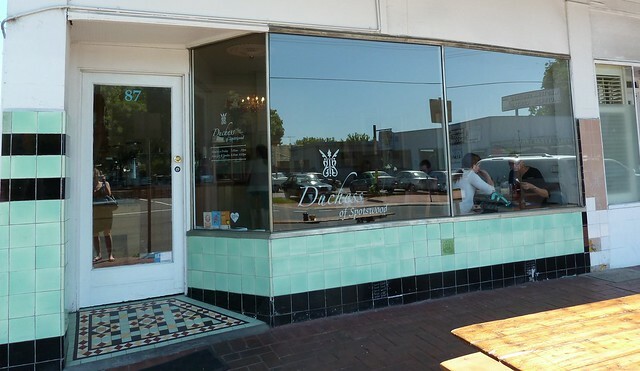 You can also check out Dahon Tea Lounge in South Melbourne for Filo-style baguettes and more. I know I'm guilty of it. You stumble across a quiet place where you're the only customer. Against your better judgment you order and are rewarded with an amazing meal. 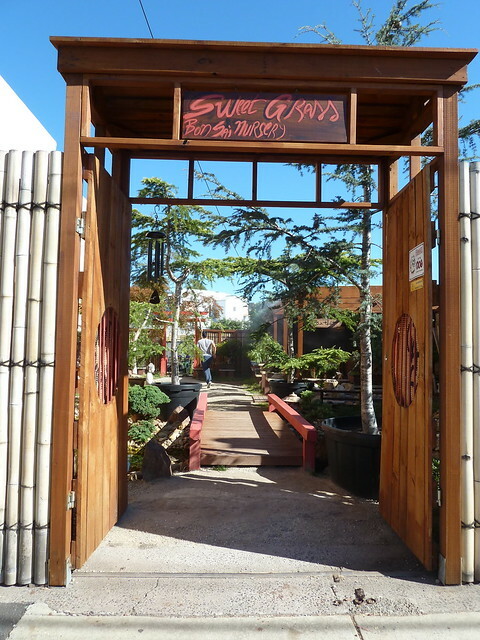 Each time you go back, you're almost always the only customer and the food's always just as good. It seems like it's your little secret, but in the end, secrets are best shared. I want the streets of Footscray bustling after 6pm on a Saturday. I want these hardworking businessmen and women to succeed widely and make all of Melbourne fall in love with their wonderful wares. 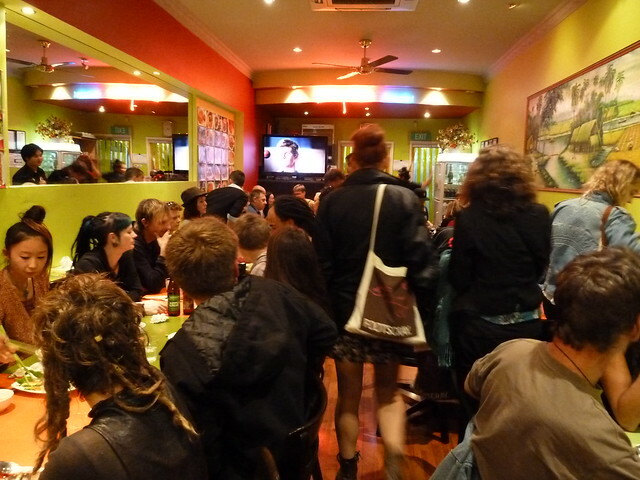 Footscray will never "run out" - there will always be enough for everyone. 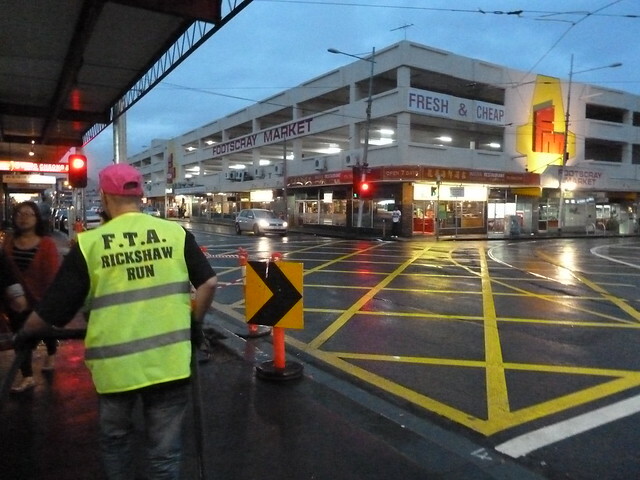 The Footscray Traders' Association is a grass roots organisation run by Footscray's traders to advocate as a united voice. They have created a fantastic, unique event for the Melbourne Food and Wine Festival that is now in its second year. 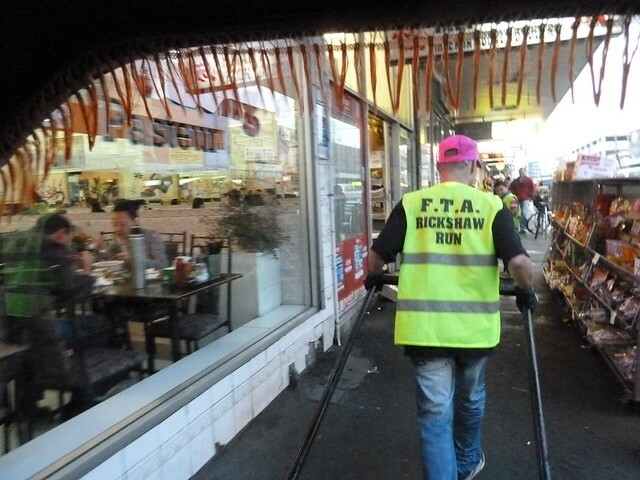 The Rickshaw Run, currently sold out despite running for lunches and dinners across a two-week period, is a whistlestop tour of Footscray's Vietnamese restaurants. I was invited along by Grant Miles of the FTA to check it out. First stop, D&K Live Seafood for freshly shucked oysters to the beat of Japanese drummers Wadaiko Rindo. 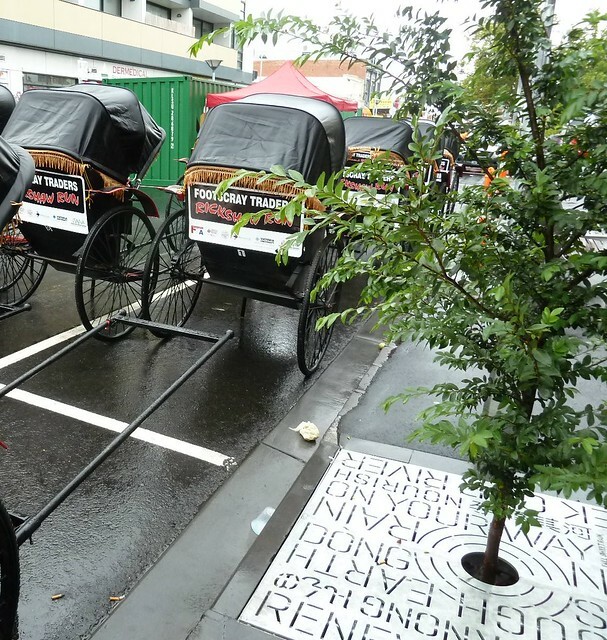 The rickshaws are gorgeous and are actually very relaxing. The "runners" (all 80 of them) are all volunteers, responding to local ads. 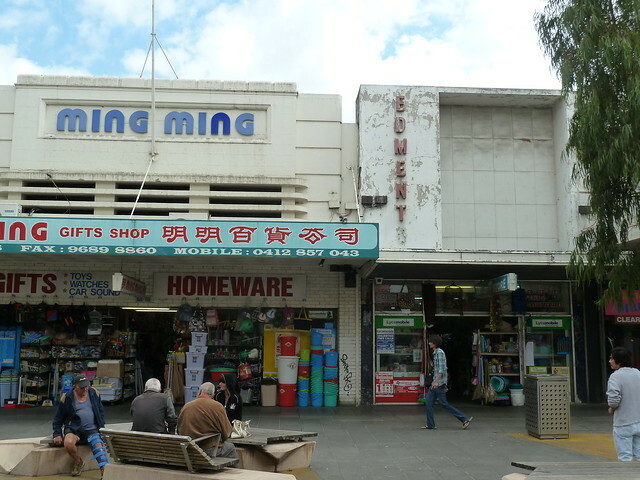 I think this says a lot about Footscray's community. 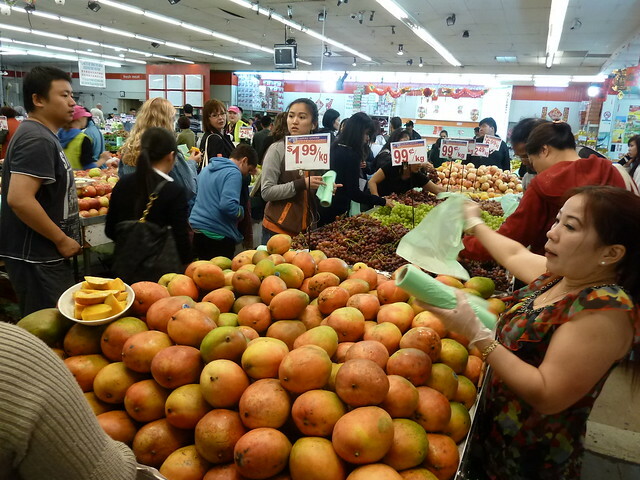 Next stop, Little Saigon, an indoor market that bursts with colour, smells and life. I love the descending bidding wars between the stallholders that happen at closing time - as they drop their mango prices down, dollar by dollar, the crowd swings back and forth en masse from each fruit stand. The group before us has never been here before and left with plastic bags groaning with fruity bargains. Samples (as well as the many out for the public). 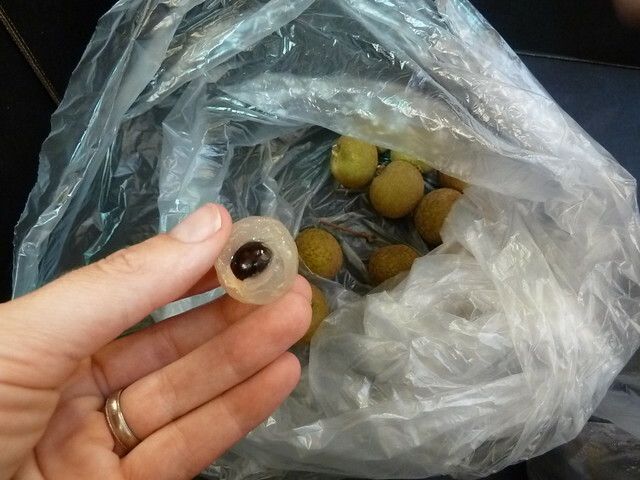 This longan or dragon's eye was new to me - it was sweet like a lychee and quite delicious. We kept saying, "Oh, we really shouldn't have another". Let's just say this sort of restraint didn't last for long. The dipping sauce here is gorgeous, thick, peanutty and creamy. It's made with coconut milk and a special vegan ingredient, cooked green mung beans! Rolling, rolling... In a rickshaw, you feel separate from "the street", kind of like you're in a pleasant bubble, yet still part of it in a way you don't if you're in a car. 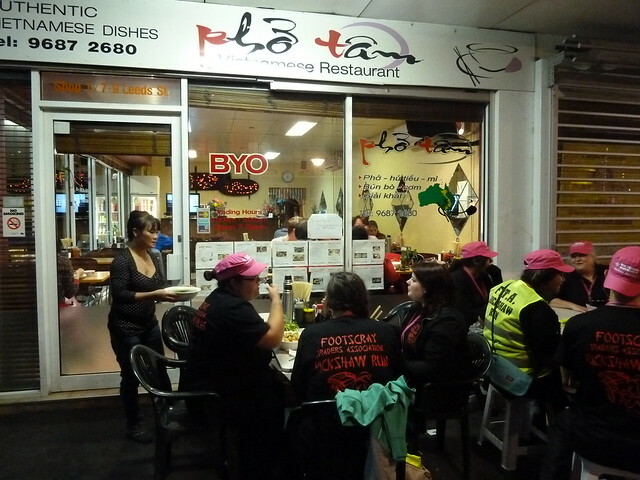 Hao Phong are a Footscray stalwart and are reliably busy every night of the week. 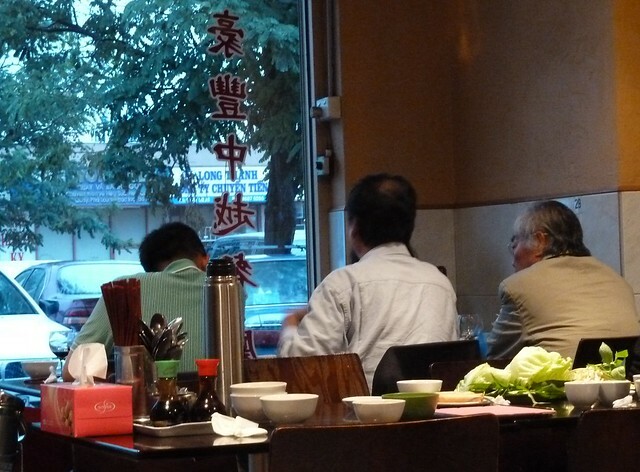 Here we sat down to lovely, steaming bowls of pho. I got lucky with warm, soothing chicken. 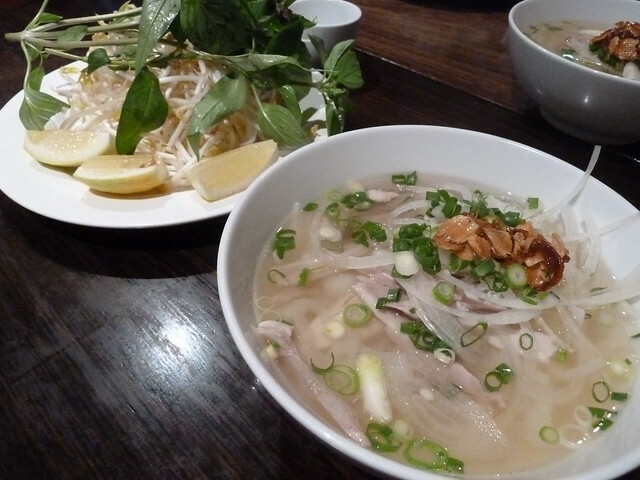 I couldn't taste the pho spices in the broth all that much but it was a great bowl of soup with fresh pho noodles and really tender chicken meat. LOVED the house-made crispy garlic and onion sprinkle! If you've ever wondered what's in the sugar dispenser on the table in many restaurants, it's Vietnamese "sate" sauce (pronounced "satay"), vaguely similar to XO with dried chilli and dried seafood in oil. 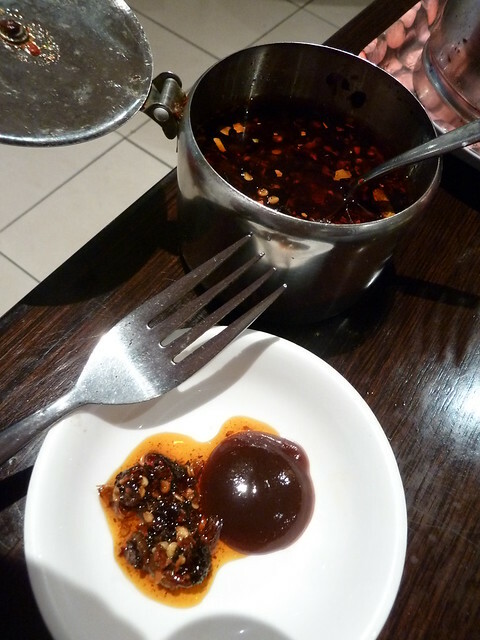 This isn't for adding to your pho (float the chillis in the broth if you want more heat) but for dipping your meat - I loved this combo (new to me) of sate sauce and hoisin (in a squeeze bottle on each table). 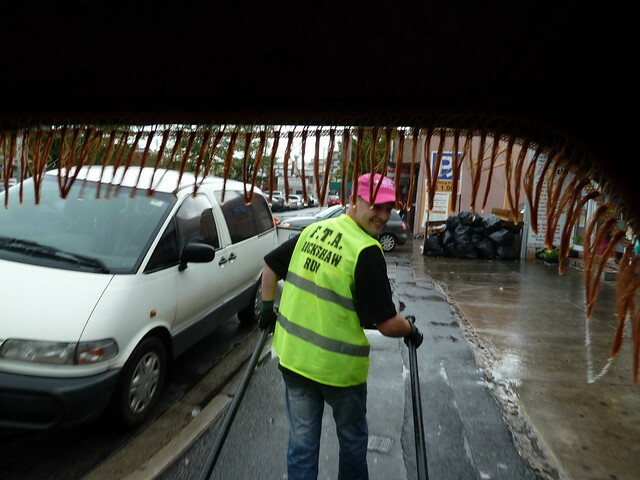 By now we were worrying for George, our trusty rickshaw man, as our combined weight was increasing with each stop, yet he remained irrepressibly bubbly and excited for our next stop. 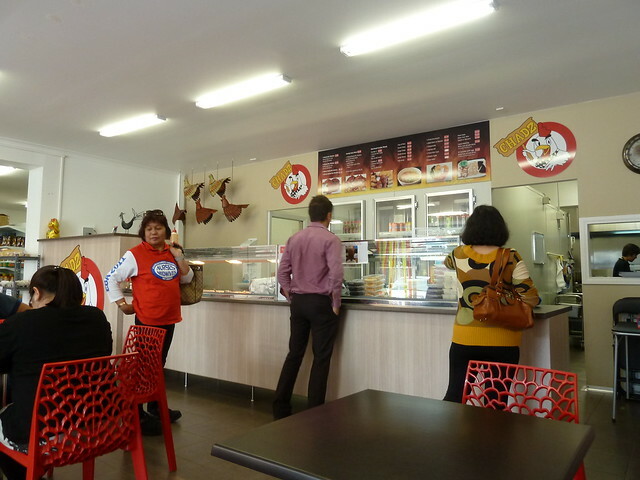 A Footscray success story - Sapa Hills started on Hopkins Street only a year or two ago but already have a new branch in Glenferrie Road, Hawthorn. Tam, the owner, is divine. Loving their smart new check uniforms. 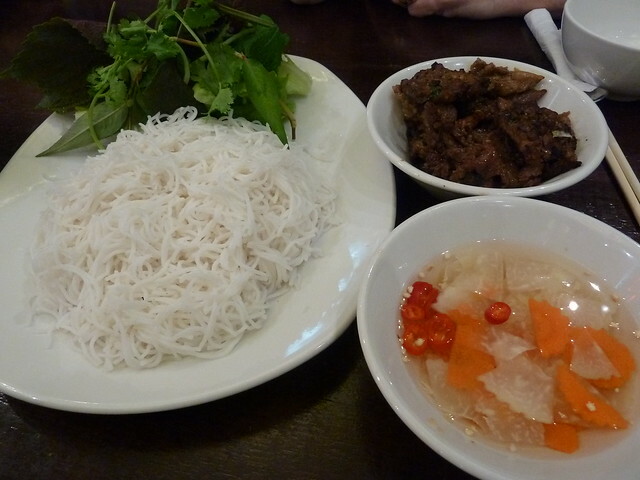 Sapa Hills are probably best known for this dish, bun cha Ha Noi. It's a northern Vietnamese BBQ dish where belly pork and pork patties are marinated and cooked over charcoal. Smoky and juicy, they're mixed with the thinner sesasoned fish sauce dressing and tossed with noodles and herbs to make your own salad. Dong Que, one of my favourite restaurants - their coleslaws are fantastic, as well as their crepes, rice flour cake with egg, Vietnamese tacos... I could go on. Dong Que made it into The Age Cheap Eats this year, woohoo! 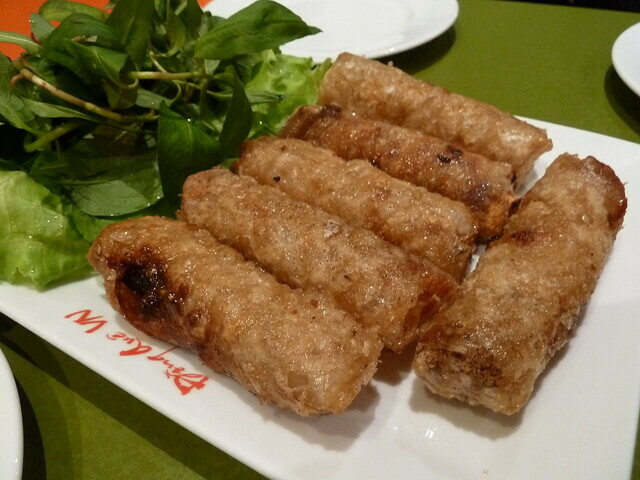 They're best known for their traditional Vietnamese spring rolls. The tiny, cigarette-shaped ones we know so well are really a more recent invention. The wheat wrappers most places use are much easier to handle and make the rolls much more robust. The true method is to use rice paper, just like the cold rice paper rolls at Sen above, with a meaty pork, noodle and mushroom filling. 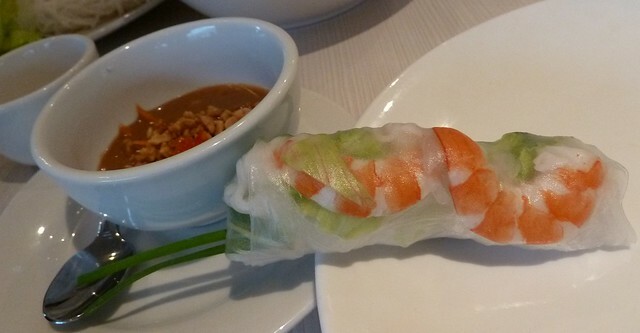 The rice paper gives a really delicate yet deliciously crackly skin. Roll in lettuce with a few mint springs - gorgeous! Despite the extra kilos on board by now, George kept us rolling up to the last stop, Pho Tam, for our choice of sweet drink. 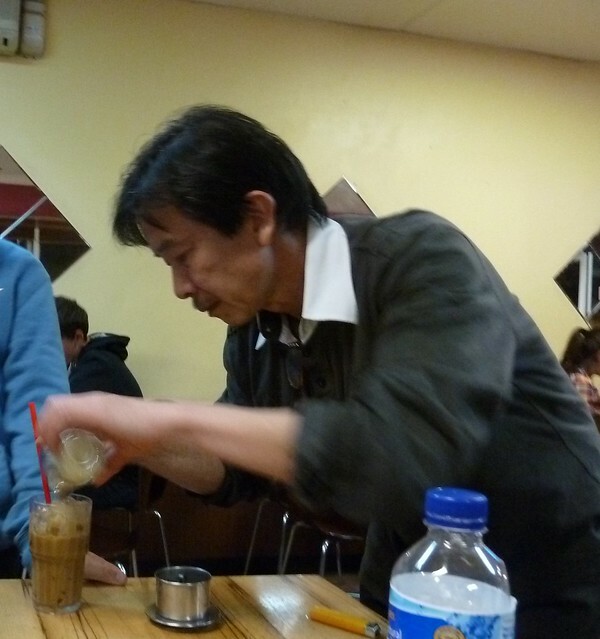 Pho Tam are one of the only places I know that do the full "Vietnamese coffee ceremony", if you like. 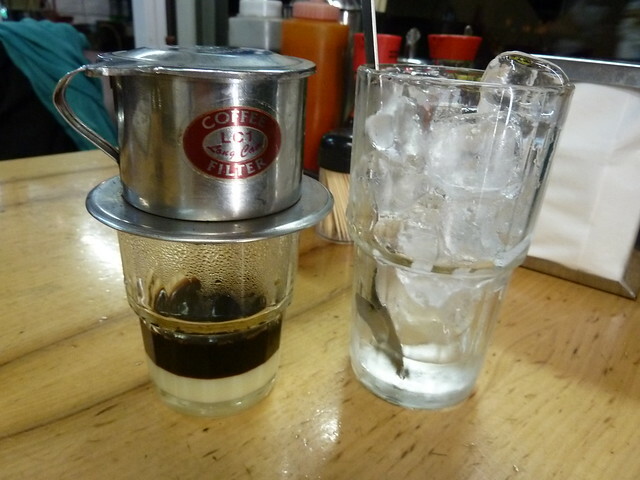 Each cup is brewed individually with the Vietnamese version of trendy filter coffee - a tiny silver contraption that drips the hot coffee slowly onto a raft of sweetened condensed milk. Help from the maestro - when the coffee's all dripped out, whip it up and pour it over for sweet, icy deliciousness. 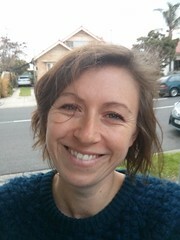 This is a great way for newcomers to Footscray to experience it. 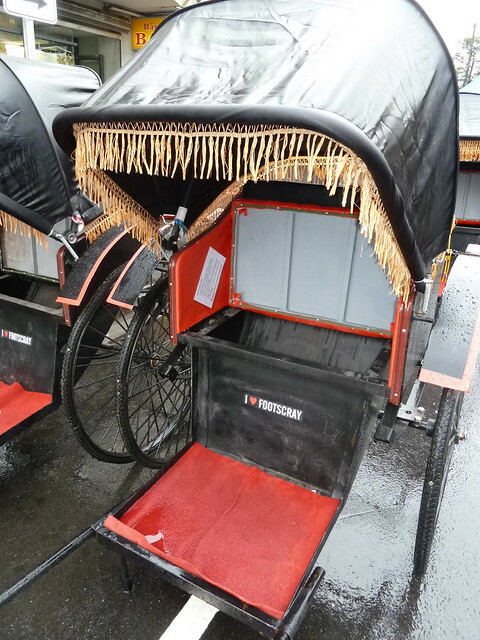 I love the rickshaw aspect of it - so much more fun than just walking around the circuit. Each dish that Footscray Traders have picked is a house specialty - not surprisingly, as they know what's good at their own place! It's also really cool to walk right in to each restaurant to a dedicated, perfectly-set table and receive your dishes within three minutes of entering. This year is totally booked out (although you can go on the waiting list) and next year there will be new restaurants and new dishes. 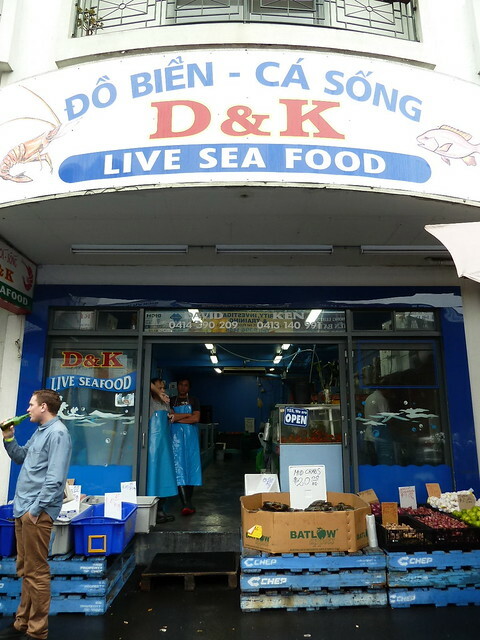 If you've never experienced Footscray, of if you're trying to "sell" it to suspicious friends or rellies, I think this is an awesome place to start. Even if you're a die-hard Footscray foodie, I still think you will discover something new - I didn't know how good Sen's rice paper rolls were, and I would definitely order the pho ga again at Hao Phong. Most of all, I love that this is a unique Footscray creation made and owned by the community. 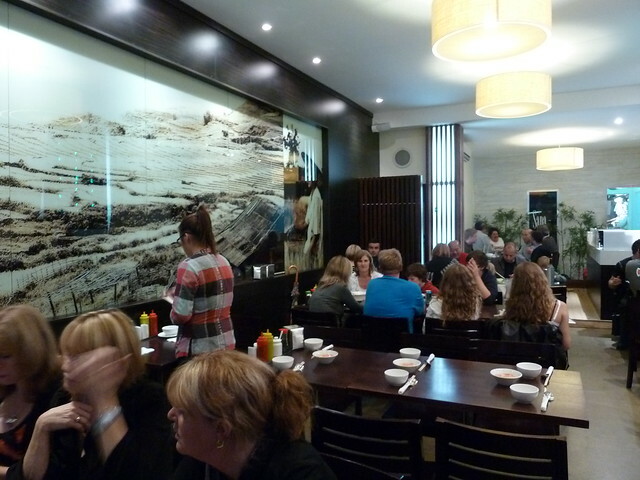 What would be your ultimate Footscray food crawl?